I promise we have been eating more than just desserts out our house recently though that might not be evident from my blog posts. This dessert screams summer and with the 4th of July just around the corner I thought it was a perfect treat to share. Our days have been filled with quite an assortment of summer activities so when I have more than a few moments at home I happily go to the kitchen. I am still learning more and more about gluten free baking and I will be honest and confess that it tries my patience. I decided to try my hand at making gluten free graham crackers for this dessert, but after I rolled them out and was trying to cut and place them on the pan I gave up. I ended up throwing the entire rolled out piece of dough on the pan and baking it whole. I am such a perfectionist and the way that gluten free baking is messing with me makes me crazy. Fortunately, this experiment worked and the graham crackers were quite delicious both with and without the ice cream. 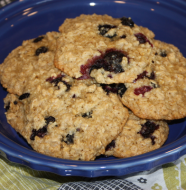 Even the family members that feel gluten makes things taste better loved these cookies. The raspberry lemon ice cream is so delicious. It is a new favorite and I could have eaten the whole bowl of it. It is light and refreshing and such a treat on a hot day! Combine the milk, 3/4 cup of the sugar, 1 cup of the cream, and the salt in a medium saucepan. Heat over medium-high, stirring occasionally, until the mixture is warmed through and small bubbles appear on the surface. Meanwhile, pour the remaining cup of cream into a bowl and set a fine mesh sieve over the top and set aside. In a separate medium bowl, whisk the egg yolks until smooth. Freeze in an ice cream maker according to the manufacturer’s instructions. Line a chilled 7 x 11″ pan with plastic wrap. While the ice cream is churning, combine the raspberries with the remaining 2 tablespoons of sugar in a small bowl. Mix to combine, mashing slightly. Let stand to macerate slightly. When the ice cream has reached a soft serve consistency, spread the ice cream into the pan in an even layer about 1 inch thick. Top the surface of the ice cream with dollops of the raspberry mixture and lightly swirl into the ice cream. Freeze until firm. 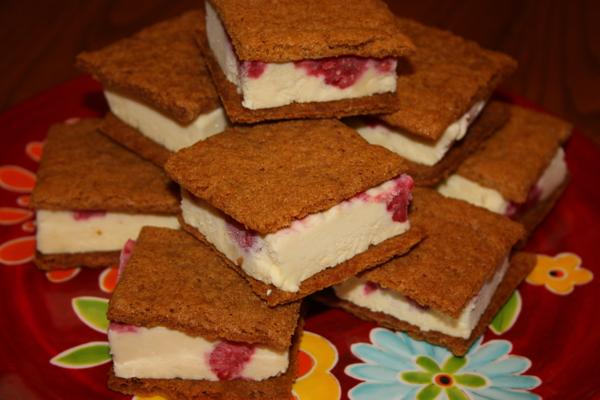 To assemble the sandwiches, cut square pieces of ice cream to match the size of your graham crackers. Layer one piece of ice cream between two of the cookies and return to the freezer immediately. Keep frozen until ready to serve.